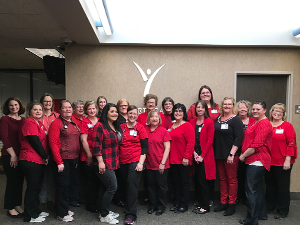 The first Friday in February, which is designated as American Heart Month, is National Wear Red Day. Wearing red to raise awareness about cardiovascular disease, especially in women, is the purpose of the annual event. Cardiovascular disease is the number one killer of women in America, causing one of every three deaths, according to the American Heart Association. Dr. Abigail Reynolds, a family medicine physician advises, “It is never too early to talk about your heart. After all, we only have one so we need to take care of it! Most women remember to get their pap smears and mammograms on a regular basis but forget about heart health which is just as important, if not more important.” Heart disease affects the blood vessels and cardiovascular system resulting in many issues such as atherosclerosis, buildup of plaque on the artery walls; heart failure or congestive heart failure, which is the heart not pumping blood as well as it should or the body not getting enough oxygen; arrhythmia which is an abnormal heart rhythm and heart valve problems to name a few. The symptoms of a heart attack in women can be different than what men may experience which include nausea/vomiting, back or jaw pain, and shortness of breath. Ninety percent of women have one or more risk factors for developing heart disease. Knowing risk factors and taking preventive steps is important. Lifestyle changes can lower your risk of developing heart disease. Some of those includes don’t smoke, manage blood sugar, stay active, eat healthily, manage a healthy weight, know your family history and lower your cholesterol. In addition to knowing risks and lifestyle changes, an annual visit to your health care provider is important. “I would encourage all women to talk with their health care provider on how they can lower their risk for heart disease” Reynolds emphasized. Yankton Medical Clinic, P.C. 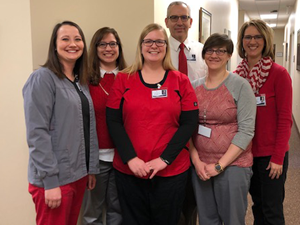 physicians and employees chose to Wear Red for Women to help bring awareness about heart disease and take part in this annual event.